Geez, I can't decide how to start this post. Ok, try this: During the State of the Freezer address, I talked about wanting to expand the blog (via frozen treat samples). It's not easy trying to have national appeal when you are stuck in just one state. Unfortunately I'm not a big fan of traveling, and the ice cream of the month club has done a good job of bringing us treats from places like the upper midwest, but I think it's time to start reaching out to try and bring the great treats of other states to the blog for all to enjoy. I should have know that Pierre's, the fine folks who brought us Hola Fruta!, would be cool enough to hook me up with their latest creation. Behold Yovation! 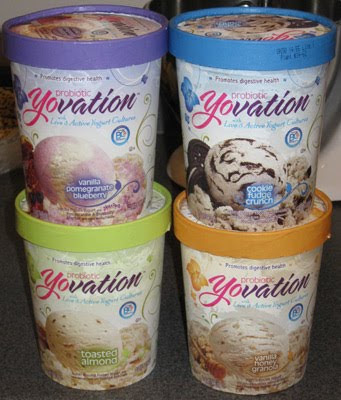 Pierre's released Yovation in 2008, but since I just found out about it last week, and since distribution isn't quite national yet, I'm going to call it new to me! They have six tasty looking flavors, and of the four before you, can you guess which one I tried first? Oh wait, I already said which one I opened in the post title. I had my choices down to two flavors when I popped the top on this one and knew it was the one I wanted to try first. 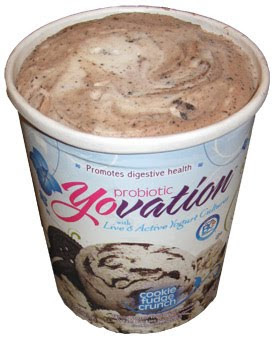 This is my new little friend: Cookie Fudge Crunch Probiotic Yovation with Live & Active Yogurt Cultures. That's right, not only does it have your standard yogurt cultures, but it has that great new buzzword "Probiotic". You can find info on the exact culture they use here, though I've looked and I haven't seen any recommendations about how much Yovation you should eat a day (I'll ask, don't worry). Now look closely at the packaging and you'll notice a word missing. Take a guess. "Tart". There is no mention of Tart anywhere, just a mention of yumminess, and that tells me this is a sweet yogurt, not a tart one (and we all know how much I DON'T like tart yogurts). The first thing I notice is that it's a little hard to scoop. It's not awful, but kinda reminiscent of an Edy's made product. I scoop myself a "healthy" size bowl and start to dig in. Though the top of the container looked like tiny cookie bits, digging down reveals the cookies and "ribbons of cookie swirl". Ribbon may not be the perfect choice of words, but there is plenty of cookie stuff so I'm not complaining. Ok, enough of this, taste testing time: I have a bite, and then a few more. I like it! 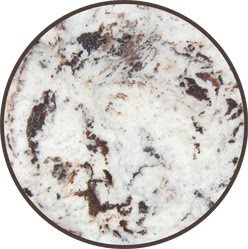 No tartness here, just a nice cookies and cream flavored yogurt. Yes, I can tell it's yogurt and not ice cream, and the texture isn't the same and there is a bit of yogurtness in every bite, but not only am I clocking in decently with saturated fat, but I'm getting a healthy. I stirred up the last bites like I would any other cookies and cream flavor and enjoyed my tiny milkshake. In fact, I decided to go back and have a bit more, stir it up, and enjoy that smush as well. There is a little bit of yogurt aftertaste as well, but nothing that would stop me from enjoying the treat. Yovation tastes a little chewy...though technically regular yogurt does to. I'm going to save a taste ranking til I've tried the other flavors, but so far, so good.